The University of Illinois at Chicago (UIC) Department of Communication takes a balanced approach to teaching communication, exposing students to both theory and research. Students seeking a Bachelor of Arts degree are expected to earn a broad-based liberal arts education in addition to taking specialized communication classes. UIC’s graduate programs focus on producing researchers. Rather than having to choose between a focus on media or intercultural studies, students in the Master of Arts program focus equally on both areas of study. UIC also offers a PhD in interactive digital communication. UIC is a research university, and the faculty of the Department of Communication is known for being unconventional, with faculty research focusing on new technology, political communication and visual communication as well as intercultural diversity, including race, ethnicity, gender and sexuality. The Department of Communication actively seeks professors who are nationally recognized in the communication field. Current faculty includes professors who have received recognition for books they have authored on the subjects of media history, political communication and rhetoric. In addition, the department boasts three professors who have been recognized for their achievements in teaching. UIC is located in the heart of Chicago on a 244-acre urban campus. Students receive the benefits of attending a major research university while simultaneously enjoying the rich culture and unmatched opportunities of one of the world’s largest cities. Globally, UIC is ranked among the top 200 research-funded institutions. UIC’s Department of Communication offers students the opportunity to conduct the research that leads to the discovery of communication knowledge that students in other communication departments across the world will be taught. UIC offers an unusually high ratio of faculty to students, averaging one faculty member for every 11 students. Unlike many universities with illustrious faculty, UIC expects its professors to teach. Three-quarters of the university’s tenured professors teach undergraduate courses. In addition, more than 80 percent of UIC’s full-time instructors have a PhD or its equivalent. UIC is well known for having one of the most diverse student populations in America. Many students live on campus, and the school has a thriving Greek system. Social activities are emphasized and Chicago is just a short distance away by public transportation. U.S. News & World Report ranked UIC the 150th best university in the country and the 79th best public university in the country in 2012. The school supports six diversity committees focusing, respectively, on Asian Americans, Women, Blacks, LGBT issues, Latinos and Persons with disabilities. US News & World Report has consistently ranked UIC as one of the top 10 most diverse universities in America. In addition, the Advocate College Guide ranked UIC one of the country’s top 100 LGBT friendly schools. 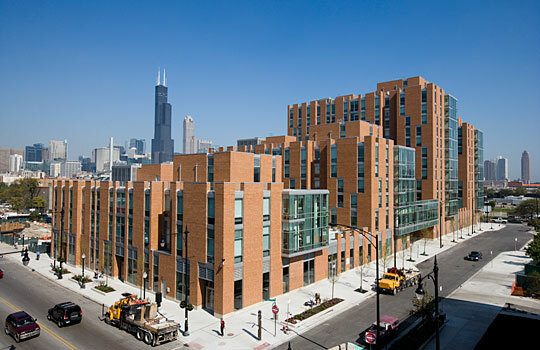 In 2006, the UIC Student Recreation Facility opened. Designed as a recreational complex for students, the facility offers a pool with a lazy river, a three-story rock wall and courts for indoor sports. Organized team sports are also important at UIC. The UIC’s teams are known as the Flames in remembrance of the Great Chicago Fire, which began near campus. In keeping with the fiery theme, the school’s mascot is Sparky D. Dragon. UIC’s teams compete in a total of 18 NCAA Division 1 sports. They are the winners of 38 conference championships. In addition, UIC offers plenty of opportunities for sports-loving students to indulge their passions, with a number of well-established intramural teams as well as student sports clubs.